The concepts surrounding this matrix are being further developed in conjunction with the Guild Sponsors and senior Planning Planet Community practitioners and supportive consultants. A downloadable version of the Matrix is available to download here. 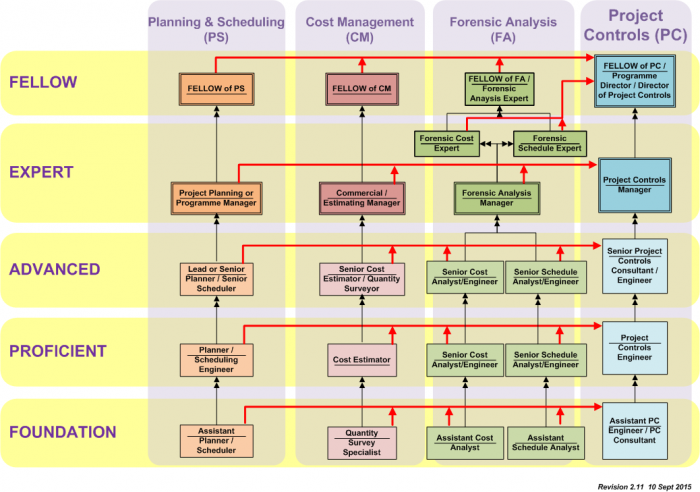 This covers the core and supplemental elements realting to Planning & Scheduling (PS), Cost Management (CM) & Forensic Analysis (FA). This consists of the Foundation Level (FND), the Proficient Level (PRF), the Advanced Level (ADV), the Expert Level (EXP) and the Fellow Level (FEL) and dovetail into our various employment roles. The names of the roles within the matrix are subject to change as Guild Sponsors and we, the practicing community, amend them so that they more closely define the actual work-roles we are employed within. This consists of descriptive statements that help to define the Knowledge and Capability Expectations placed upon us when employed within these roles when carrying out the work we do. These essentially define the syllabus for validation of knowledge and capability. This consists of defined activities and achievements that the Guild expects of us in order for the Assessors and the Examiner, to ascertain where each of us sit within the Career Streams. The Guild of Project Controls is an organisation created by us (the practitioners), for us (the practitioners), and indeed, run by us the Project Controls Community, and encompasses multiple industries and reaches throughout the entire World. What is more, it is fast becoming recognised by world leading employers (the Guild Sponsors) as a potential yard stick against which we are to be measured and helps give definition to what we do and how we do it within our daily working lives.